Piedmont Hospital in Atlanta is one of the biggest and best in the city and they have a wonderful tradition. There in the middle of all the living and dying that goes on in a big city hospital, they play Brahms’ Lullaby over the intercom throughout the hospital whenever a baby is born. Everyone who knows of the tradition stops and smiles and listens to the whole thing in celebration and thanksgiving. 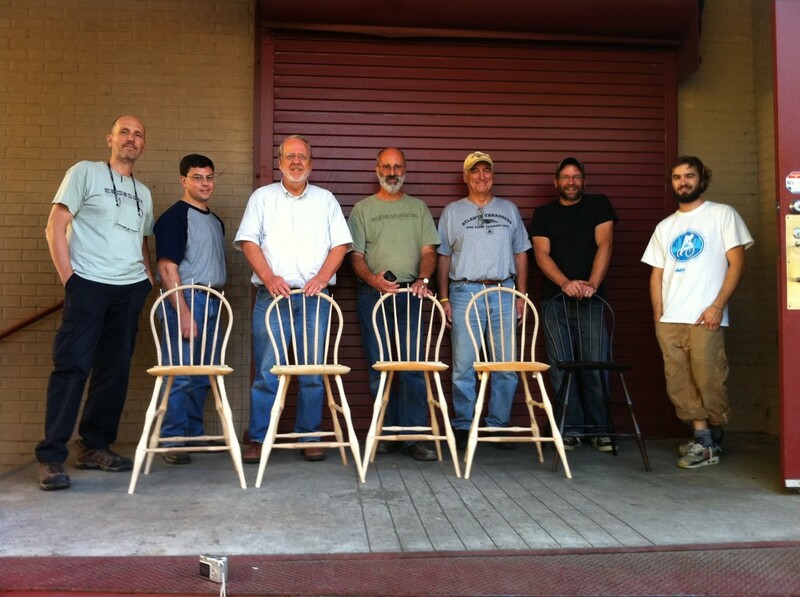 I tell you all this in celebration of the birth of six new Child’s Windsor Chairs. I told Peter this afternoon that we should stop and sing something or do a little dance or stop and shout “Chair” with our hands in the air so everyone would stop and smile and celebrate with us. This morning we started out by cleaning up the seats and scraping them smooth. We trimmed off the leg tops and made ‘em look real pretty. After we pulled our bows out of the heated closet we had left them in all week, we cleaned them up and got them ready to install in the seat. We trimmed the ends to fit and then got the back spindles ready to plug into the seats. 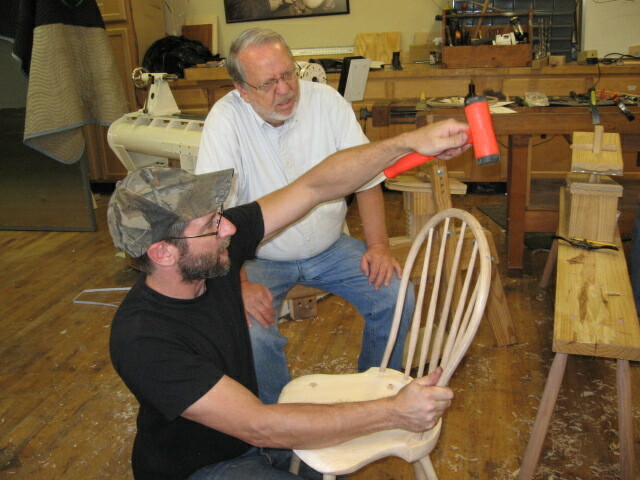 After a long lesson on how to drill the holes in the bow so the spindles will fit correctly, we drilled the holes and fitted the spindles and finally glued and wedged the bow back into the seat. A new chair entered the world. Each of us took particular pride and joy in sitting down on our chair for the first time. It is done and all the guys have left town. It will certainly be different going to my shop by myself next week. This was a great class and Peter Galbert is a fine chair maker, wood turner and woodworking teacher. 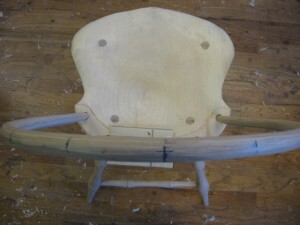 My new Windsor chair is beautiful, if I do say so myself. Want to see our graduation picture? From left to right there is Daniel, Corey, Terry, Dana, Rich, Peter and Andy. Photos for the last two days are by Ed Scent, a staffer at Highland Woodworking. Want to read the rest of this series? 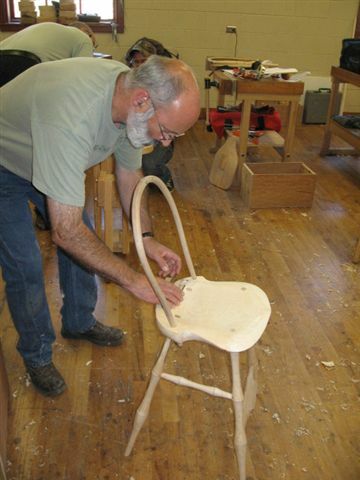 Start at the beginning with Day 1 of Peter Galbert’s Windsor Chair class. 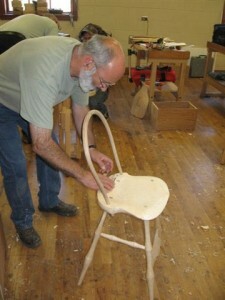 Building a Windsor Chair with Peter Galbert, Day 6: Legs and Stretchers How Many Tools?